L ast week, 20 students and four chaperones from Denis-Yarmouth Regional High School visited our labs in Cambridge, MA to learn about the wide variety of science careers that Addgenies represent. 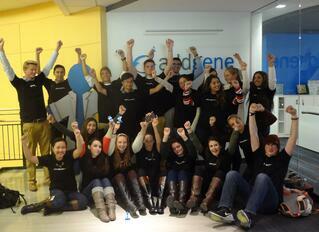 They kicked off their day with breakfast and an introduction to Addgene with our Executive Director, Joanne Kamens. As a regular contributor of careers blog articles, Joanne had plenty of advice for the group of juniors and seniors, including that it’s never too early to start networking! 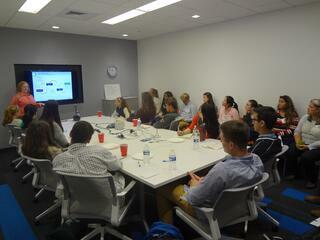 Afterwards, the students split into two groups for an in-depth look at some of the teams at Addgene. An introduction to plasmids with Director of Biology Lianna Swanson was very popular, with the students excited to see a real working lab full of busy Addgenies preparing plasmid samples for shipping. This was the favorite part of their visit for many, including Natalie Reid who said “Seeing the bacteria on the toothpick was very cool!” and Izzy Shaw, who was excited about “Seeing a real lab!”. And several of our visitors made sure to tell us what we already knew about our Shipping Operations Coordinator: “Kory was awesome!”. Blugene loves to visit researchers, so Outreach Scientist Jessica Welch showed some highlights of his travels from 2015, including a great European photo slideshow from our UK team member Benoit Giquel. Bluegene’s globetrotting impressed our guests, as did how much work is put into making sure scientists all over the world know that we can help with plasmid sharing! Judging by how many prizes were given out during the lunchtime pizza and trivia rounds, Senior Scientist Joel McDade’s presentation on the emerging CRISPR genome editing technology was a rousing success! Many of the students were interested to see so many different career options in science, with Abigail Anderson commenting that “There is not just a scientist or a professor. There are amazing opportunities that are offered with a biology major.” After hearing about many Addgenies’ career paths, Michelle Healy said “You are always learning and that means it is possible to switch your field.” Abigail was also impressed with the “comfortable surroundings” of the new Addgene office space. Thanks Abigail, we think it’s pretty great, too! 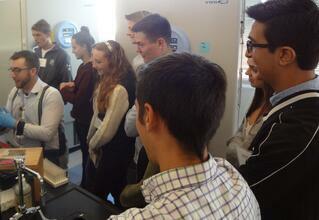 Thanks to MassBioEd for organizing such a great day, we look forward to hosting more students next year! Does your lab or organization do work to help improve K-12 education? Let us know about your educational events in the comments section below!